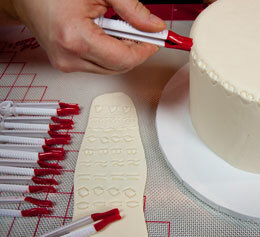 These professional tools are disigned to emboss unique and distinctive designs into fondant and sugar paste. Each set includes 10 unique designs that provide distinct detail to any cake. Manufactured from an extremely durable and completely seamless polycarbonate material, each crimper features an adjustable silicone ring for effortless sizing.